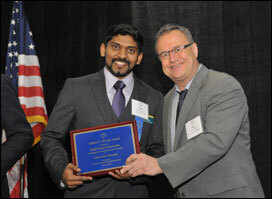 Ranjit Godavarthy, associate research fellow with Upper Great Plains Transportation Institute, won the Wootan Award for Outstanding Ph.D. Dissertation in Policy and Planning from the Council for University Transportation Centers (CUTC). Godavarthy completed his dissertation, "Network and Design Guidelines for Accommodating Large Trucks at Roundabouts," at Kansas State University. He was presented the award at the CUTC Annual Winter Meeting & Banquet, which took place in conjunction with the Transportation Research Board (TRB) Annual Meeting in Washington, DC, on Jan. 11.